Due to high demand, all 800 tickets have been claimed. 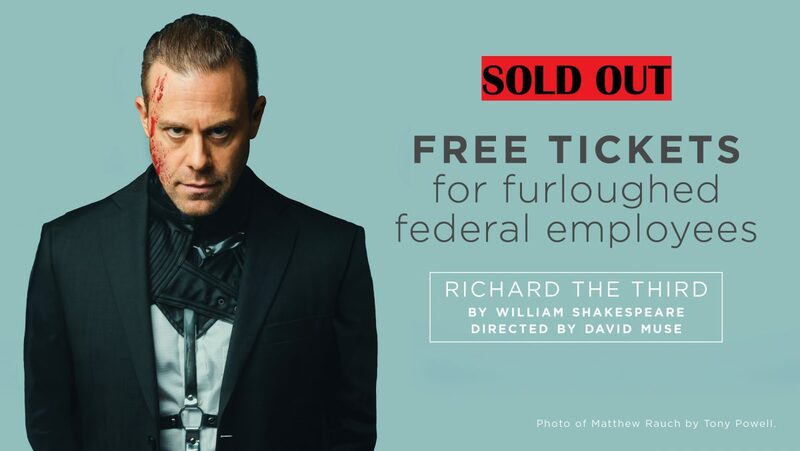 Shakespeare Theatre Company is pleased to offer FREE tickets to Federal government employees affected by the government shutdown for our production of Richard the Third. This offer is good for any performance February 5-10. Use promo code FEDERAL19 when reserving tickets. Tickets may be ordered online, by phone, or at the box office. A valid Federal ID is required when picking up tickets at the box office. Sidney Harman HallValid Federal ID must be presented at box office when picking up tickets. Limit 4 tickets per ID.